A laser measure is the quickest and easiest way to get measurements and convert them into just about any information you might need, from different measurements to unit conversations. Not all of these tools are created equal, though, which is why we researched some of the best-selling and most popular products and put together this laser measurer review. Before we get started, let’s take a look at some of the key features you should keep in mind. Range: The is the length at which you can get an accurate measurement with the tool. They vary a lot, from 30 to 330 feet. Make sure you get one that has a range long enough for your projects. Backlit: A backlit display is much easier to read, especially in low light. Most of these picks have one. If you’re planning to work at night or know that you’ll be working in a tight space, a backlit display is necessary. Battery: Most of these measuring tools are powered by standard AAA batteries and a lot of them even come with the batteries included. We did find one that has a rechargeable lithium ion battery if you prefer that to AAAs. Carrying Case: Some of these tools come with a carrying case or pouch. These are great because most of them attach to your belt so you always have your laser measure handy when you need it on the job. Size: You can see by the dimensions of these products that they’re all pretty small. In fact, most of them can fit right inside your pocket which is super convenient if you’re already bogged down with tools and equipment. Warranty: All of these products are covered by some kind of warranty and the coverage ranges from between 1 and 3 years. Make sure you know what’s covered for the product you choose and, more importantly, what isn’t covered. Now that you know a little bit more about what to look for, let’s move on to the next part of our Laser measure buying guide. If you’re pressed for time, don’t worry. We put our top and budget picks right at the top of the list so you’ll be sure to see them. If you can, stick around because all of these products are pretty great and each is unique in its own way. Alright, are you ready? Here we go! 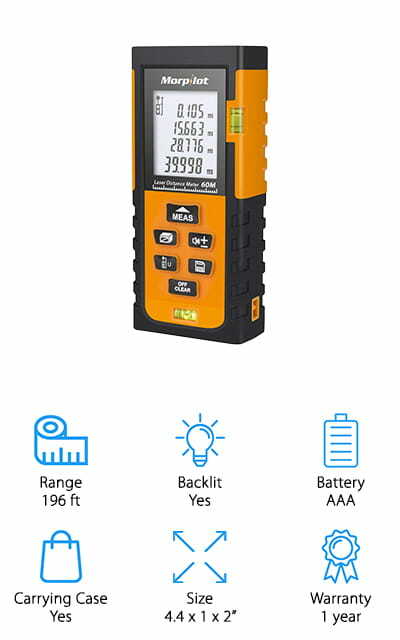 The Dewalt DW03050 laser distance measurer is our pick for best laser measuring tool because it’s loaded with so many awesome features. For one thing, it automatically calculates area and volume. Plus, it provides an indirect height measurement using the magic of geometry and the Pythagorean theorem. And get this, it even automatically stores the last 5 measurements so if you forget to write something down, all you have to do is scroll through the history to find it. The backlit display is easy to read because you can see it clearly in any light. 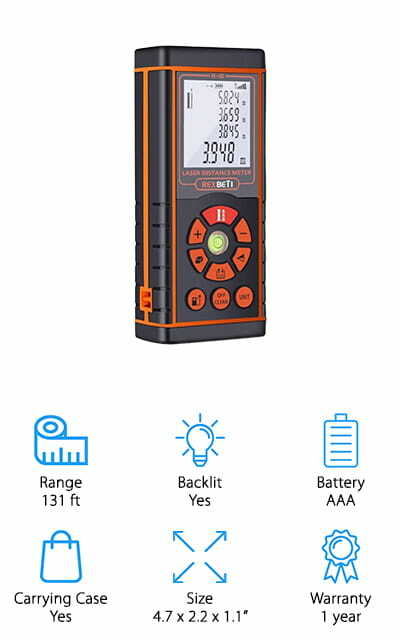 Not only does this measuring tool come with the necessary AAA batteries, it also includes a protective pouch with a belt loop so you can keep it within reach when out on the job. 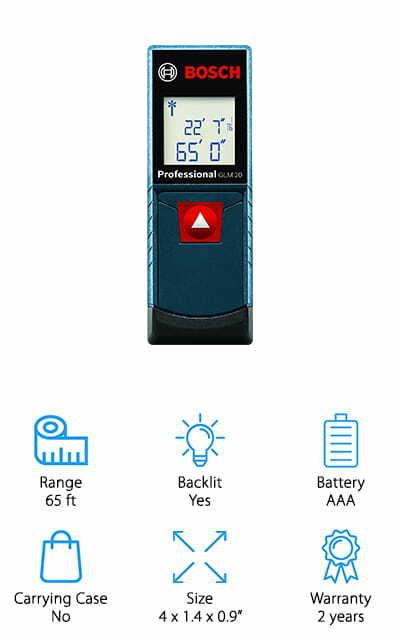 Anyone trying to stick to a budget will love the Tacklife Laser Measure, the best laser measurer for cheap. It’s actually really accurate within with a margin of error of only 1/16 of an inch. You can change the display from meters to inches to feet which makes converting measurements practically effortless. The LCD is backlit for improved visibility in low light areas. This tool provides a lot of different measurements, too, including area, distance, volume, Pythagorean method height, addition, and subtraction. There are so many ways you can use this measurer. That’s not all, to save battery life, it automatically shuts down after it’s not in use for 150 seconds and there’s a low battery indicator so you’re not surprised when it comes time to replace it. 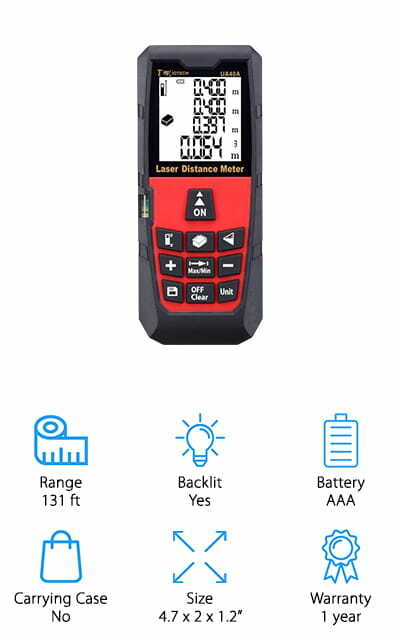 Next up is the Leica DISTO, the best laser distance measurer that’s Bluetooth compatible. Why do you need Bluetooth on a measurer? Get this, it can automatically transfer measurements into the free Leica DISTO Sketch app or any other compatible app or software on iOS or Android. It’s accurate to 1/16 of an inch and a single battery powers up to 1000 measurements. The memory stores up to 10 measurements at a time. It has a lot of different functions, too, including area, volume, 2 and 3 point Pythagoras functions, addition, subtractions, a countdown timer, and an intelligent end piece that helps get reading in even hard to reach places. One more thing, the backlit LCD screen is easy to see even in low lighting conditions. 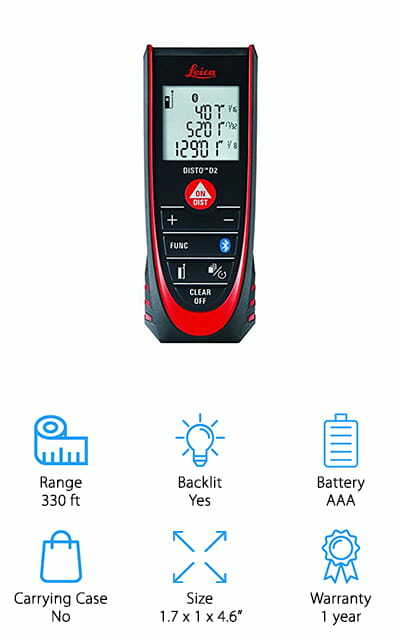 An awesome Bosch laser distance measurer is the Blaze, a professional grade tool from a well-known, reliable company. 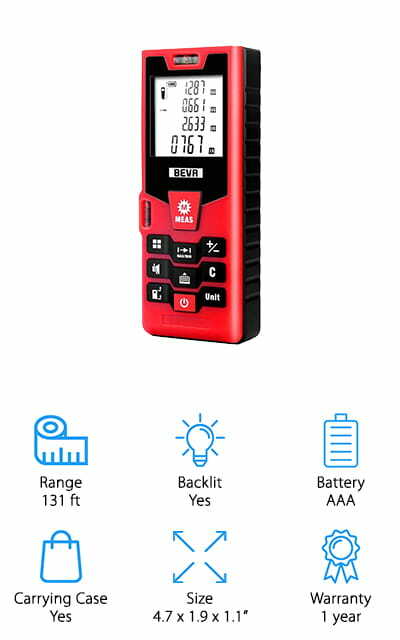 It’s accurate to within ⅛ inch and can give measurements in meters, feet and inches, or inches only on the east to read, backlit display. Another cool thing about it is it’s ridiculously easy to use thanks to the simple, one-button operation. As you move closer to the target, it gives you real-time measurements of your distance, much like a tape measure would. This tool is also really compact and can easily fit into any tool box or bag. The backlit display is easy to read and helps increase accuracy even in low light. 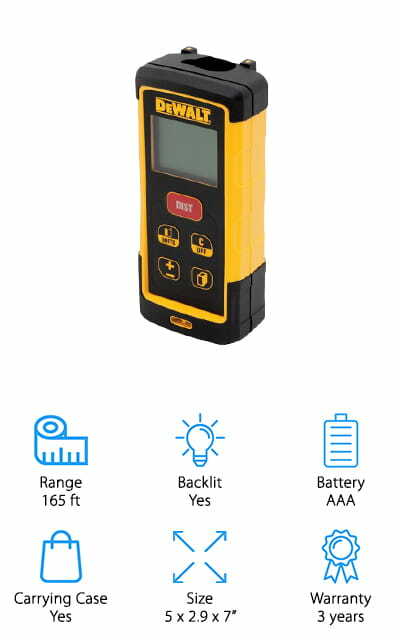 This measuring tool comes with the necessary AAA batteries and also includes a 2-year warranty. The Suaoki Laser Measure is up next in our laser measure reviews. This is one of the most accurate measurers we found with a margin of error of 0.08 inch. You can switch it to read in meter, inches, or feet and it even stores the last 20 measurements so you can look back if you forgot to write something down. The bright, LCD display is easy to read in any kind of light. And get this, there’s a small bubble level in the bottom so you know if the surface you’re setting the measurer on is flat. It gives you a lot of measurements, too: distance, continuous, area, volume, and two point Pythagorean for height estimates. That’s not all, for increased durability, the case has reinforced rubber housing. The best outdoor laser distance measurer we found in our research it the Morpilot Laser Tape Measure. It has a lot of really cool features that make this a really useful tool. For starters, it has 2 bubble levels, vertical and horizontal, so you can be sure that the surface you’re placing it on to get measurements is flat. You can switch the units from meters to inches to feet, too, and everything is easy to read on the bright LCD display. In addition to distance, this tool also measures area, volume, continuous measurement, 3-point Pythagorean method, and even addition and subtraction. The memory can store up to 30 measurements and does its own self-calibration. To save battery life, it also turns off after 150 seconds of inactivity. 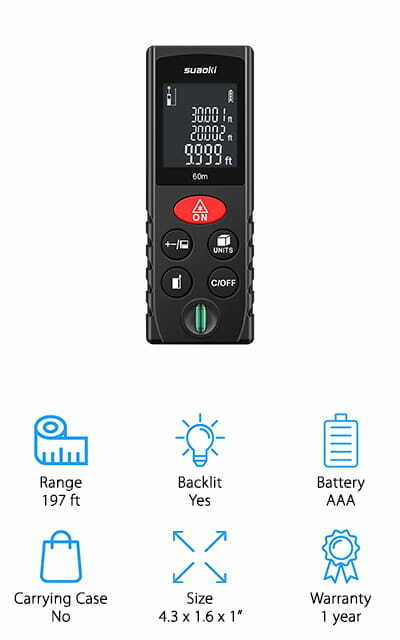 For the best laser measure for architects, take a look at this one from DMiotech. One button operation gives you distance, area, volume, and indirect measurement using the Pythagorean theorem, all at the push of a button. Plus, it stores the last 20 measurements in case you need to look back. The LCD screen is large, easy to read, and has a backlight so you can see it in any lighting conditions. This tool is highly accurate and widely used in the construction and interior design industries. It’s equipped with a bubble level and can act as a spirit level in a pinch. Plus, the AAA batteries needed to power it are included and there’s even a battery status light so you’ll know when it’s time to replace them. The BEVA Laser Measure is really accurate. Believe it or not, up to 0.06 inches. The large LCD display shows measurements in either meters, inches, or feet. Plus, it’s backlit so you can see it in any light. This tool can measure distance, square feet, cubic feet, as well as doing a continuous measurement and Pythagorean mode. The memory stores the last 20 measurements, too, so you have a lot of information to look back on if you need it. 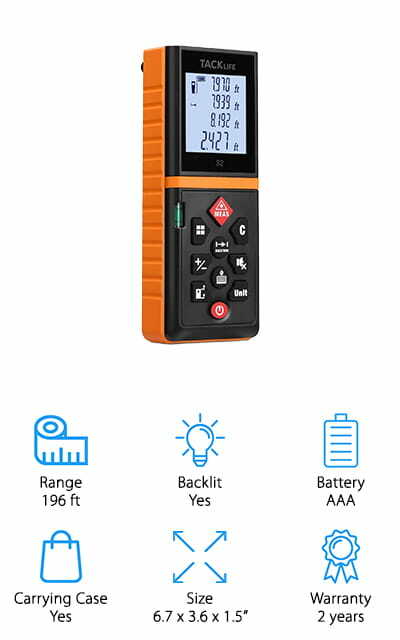 It’s a good outdoor laser measure in the right lighting conditions because it’s both dustproof and waterproof. That’s not all, if you need to work quietly, there’s a mute setting so you won’t disturb anyone around you. It’s lightweight and compact, too, and even comes with a belt clip. The next item in our laser distance measurer reviews is the Stanley Laser Measure. Stanley is a reliable brand when it comes to power tools and this measurer is no exception. It has a ¼-inch accuracy at 30 feet which is perfect for tackling most simple measuring and estimating tasks around the house. This is a really simple design that’s perfect for everyday measuring. As for power, this tool has a rechargeable lithium ion battery that easily recharges with a simple USB cord. It’s the perfect size to slip right in your pocket so you can take it anywhere and it even has a wrist strap so you can hold onto it while you work. This tool comes with the necessary USB charging cable and is covered by a 2-year warranty. Last up is the impressive RexBeTi Laser Measurer, one of the most accurate and versatile items we found in our research. This tool is accurate up to 1/16-inch and has multiple measuring functions. Get distance, area, volume, continuous measurements, the Pythagorean method, addition, and subtraction. It stores up to 20 measurements, too. The smart design remembers the units you use so you don’t have to keep switching them with every use. The large LCD is backlit for easy visibility and displays measurements in meters, inches, or feet. This tool is a small, compact size that’s easy to travel with. It’s also dust proof and waterproof and includes both a wrist strap and a leather pouch with a belt loop. The AAA batteries are included and it’s also covered by a 1-year warranty.